Hong Kong Island (Chinese: 香港島; Cantonese Yale: Hēunggóng dóu) is an island in the southern part of Hong Kong. It has a population of 1,289,500 and its population density is 16,390/km², as of 2008[update]. The island had a population of about 3,000 inhabitants scattered in a dozen fishing villages when it was occupied by the United Kingdom in the First Opium War. In 1842, the island was formally ceded in perpetuity to the UK under the Treaty of Nanking and the City of Victoria was then established on the island by the British Force in honour of Queen Victoria. The island is home to many of the most famous sights in Hong Kong, such as "The Peak", Ocean Park, many historical sites and various large shopping centres. The mountain ranges across the island are also famous for hiking. The northern part of Hong Kong Island, together with Kowloon and Tsuen Wan New Town, forms the core urban area of Hong Kong. Their combined area is approximately 88.3 square kilometres (34.1 square miles) and their combined population (that of the northern part of the island and of Kowloon) is approximately 3,156,500, reflecting a population density of 35,700/km² (91,500/sq. mi.). Hong Kong Island is one of the five Legislative Council geographical constituencies. Hong Kong island became a colony of the British Empire when their forces defeated the Chinese in the First Opium War (1839-1842). The island was populated by only a few thousand people when British empire colonized it, and was thus described as being almost uninhabited. The Second World War was a dark period for Hong Kong. In the 1930s, the British anticipated a Japanese attack on Hong Kong. As Wong Nai Chung Gap was a strategic important place of defence, large-scale defensive works were constructed there, including anti-aircraft batteries, howitzers, and machine gun nests. The Battle of Hong Kong began on 8 December 1941. British, Canadian, Indian armies and the Hong Kong Volunteer Defence Forces resisted the Japanese invasion commanded by Sakai Takashi, which began eight hours after the attack on Pearl Harbor. However, the Japanese were able to take control of the Hong Kong skies on the first day of attack, outnumbering the defenders. The defenders retreated from the Gin Drinker's Line and consequently from Kowloon under heavy aerial bombardment and artillery barrage. On 18 December, the Japanese had conquered North Point, reaching Wong Nai Chung Gap on the next day. English and Scottish forces and the Canadian Winnipeg Grenadiers vigorously defended the crucial point of Wong Nai Chung Gap, and for a while successfully secured the passage between Central and the secluded southern parts of the island. Japanese casualties were about 600. However, Allied forces there were ultimately defeated by the Japanese on 23 December, and Wong Nai Chung Reservoir was lost – the only one in Hong Kong at the time. As Wan Chai Gap had also fallen that same day, the British had no choice but to surrender. Hong Kong was surrendered on 25 December 1941, thereafter often called "Black Christmas" by locals. The Governor of Hong Kong, Mark Young, surrendered in person at the temporary Japanese headquarters, on the third floor of the Peninsula Hotel, thus beginning the Japanese occupation of Hong Kong. Isogai Rensuke became the first Japanese governor of Hong Kong. Hyper-inflation and food rationing followed; and the Japanese declared Hong Kong Dollars illegal. The Japanese enforced a repatriation policy throughout the period of occupation because of the scarcity of food and the possible counter-attack of the Allies. As a result, the unemployed were deported to the Mainland, and the population of Hong Kong had dwindled from 1.6 million in 1941 to 600,000 in 1945. 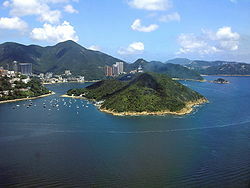 Hong Kong Island is the second-largest island of the territory, the largest being Lantau Island. Its area is 78.59 km2 (30.34 sq mi), including 6.98 km2 (2.69 sq mi) of land reclaimed since 1887 and some smaller scale ones since 1851. It makes up approximately 7% of the total territory. It is separated from the mainland (Kowloon Peninsula and New Territories) by Victoria Harbour. Most of the hills across the middle of the island are included within the country parks. The population as of 2011[update] is 1,270,876, which makes up approximately 19% of that of Hong Kong. 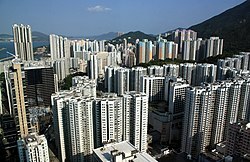 Its population density is higher than for the whole of Hong Kong, ca. 18,000 per km². However, the population is heavily concentrated along the northern shore. The combined population of Central and Western, Wan Chai, and Eastern is 1,085,500, giving this urbanised part of the island a density of around 26,000 per km², or 67,000 per mi², in its approximately 41.3 km2 (15.9 sq mi). The residents living in the Central and Western and Wanchai districts of Hong Kong island have the highest median household income of any area in Hong Kong. Affluent districts on Hong Kong Island are The Peak, Western Mid-Levels (Conduit Road/Robinson Road/Magazine Gap Road/Kotewall Road etc. ), Eastern Mid-Levels (Happy Valley/Tai Hang/Jardine's Lookout), Tai Tam, Deep Water Bay and Repulse Bay. 88.5% of Hong Kong Island's residents are of Chinese descent. The largest ethnic minority groups are Filipinos (4%), Indonesians (2.4%), and White people (2.4%). 80.2% of Hong Kong Island's residents use Cantonese as their usual language, while 8% use English and 1.9% use Mandarin. Six of the MTR rapid transit system's eleven lines service Hong Kong Island. The Island line and South Island line run exclusively on Hong Kong Island, with the Island line serving the north shore at 17 stations, and the South Island line connecting four stations on Ap Lei Chau and in Wong Chuk Hang to the north shore at Admiralty station. Four MTR lines – the Tsuen Wan line, the Tseung Kwan O line, the Tung Chung line and the Airport Express – connect the north shore with Kowloon and provide onward service to the New Territories; the East Rail line is to provide another cross-harbour connection upon its extension from Hung Hom station to Admiralty station in 2021. In future, the planned North Island line infrastructure project would extend both the Tung Chung line and the Tseung Kwan O line to connect them to each other, forming a route parallel to the middle section of the Island line. Two other rail systems, Hong Kong Tramways and the Peak Tram, also run exclusively on Hong Kong Island. The former runs mostly parallel to the Island line between Kennedy Town and Shau Kei Wan, with a loop linking Causeway Bay and Happy Valley; the latter is a funicular linking Central District to Victoria Peak. One of the many tunnels that link Kowloon and Hong Kong island. 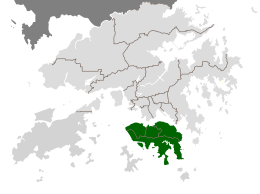 Hong Kong Island is connected to the Kowloon Peninsula on the mainland by two road-only tunnels (the Cross-Harbour Tunnel and the Western Harbour Tunnel), two MTR railway tunnels (Tsuen Wan line and Tung Chung line/Airport Express) and one combined road and MTR rail link tunnel (Eastern Harbour Tunnel, containing the Tseung Kwan O line and road traffic in separate parallel conduits). There are no bridges between the island and Kowloon, although two bridges – the Ap Lei Chau Bridge, a road bridge, and Aberdeen Channel Bridge, part of the South Island line – connect the island to Ap Lei Chau. ^ T. L. Tsim (1 January 1989). The Other Hong Kong Report 1989. Chinese University Press. p. 391. ^ "Highways Department - Island Line". www.hyd.gov.hk. Highways Department of the Government of Hong Kong. Retrieved 8 January 2019. ^ "Highways Department - South Island Line(East)". www.hyd.gov.hk. Highways Department of the Government of Hong Kong. Retrieved 8 January 2019. Wikimedia Commons has media related to Hong Kong Island.